Catching Shad from Learn To Catch Catfish is an in depth guide on locating and catching shad for catfish bait. The Catching shad program covers everything you need to know about locating and catching shad from how to choose the right cast net and learn to throw it, to learning how and where to find shad all year long. The Catching Shad book is about much more than locating and catching shad though, it is about locating and catching blue catfish as well because when you find the bait, you find the fish. 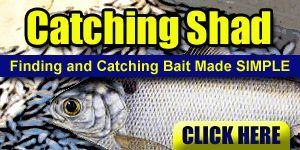 Learning to locate and catch shad will help you find and catch blue catfish.